Welcome to the 2012 oprainfall Awards. Now, I wanted this to be like an actual awards show with special guests, musical acts, randomness, and a monologue that does nothing but stroke the ego of the host. Sadly, I couldn’t get any special guests so the oprainfall staff will have to do. But I do have a monologue that is unrelated to this and only serves to stroke my ego. Also, it’s a poem, so be advised that it will be bad – you know, like having out of place celebrities at the VGAs. To find out that, somehow, the power went away. No, this was not the apocalypse or from him being broke. This was all about nature and God playing a joke. That everyone and everything had power on his block. This left him bored, and confused in a way. only taking a break when the guard talked for a smidge’. He drive around Windsor ’till he passed a large store. He pulled into the lot and skipped in with delight. as he found nothing different… except a mini Wii. As he looked around for someone with info to glean. who came at him doing what I can only call a prance. why did Nintendo go and make these mini Wiis? “To play Wii games.” He paused. “The compatibility is gone, at least one version ago. Compatibility with GameCube on this is a confirmed no. He smiled as if he said something rather pro. Jeff knew that was true. “It makes sense to me. Lance shook his head, “I’m afraid they’re not there. There is no VC or even WiiWare. I’m almost proud of that. No more games for a creeper. But the problem of Wii mini goes much deeper. “Then what’s the point of this,” Jeff said, frustrated. “Why would you sell a console that’s castrated? Who is this for? This makes no sense to me. Why would Nintendo go and neuter the Wii? Lance shrugged and walked off, saying to Jeff no more. Frankly, whoever came up with this is a cash whore. not caring who got in his way or had to push. but it was far too late to save Jeffrey’s sanity. His mind was shot, his mouth began to rant. The cops told him to stop but he simply can’t. There’s nothing they can do that will make him feel well. For the “Wii Castrated” should only exist in Hell. Apologies if you ended up like Ford Prefect. Although, in my defense, I only write the fourth worst poetry in the known universe. Anyways, this will be a three-part post with 20 categories starting today and going all the way through Friday when we announce our Game of the Year. All new games that were released are eligible. Remakes are welcome but only if they improved enough over their previous version. And all console awards will be awarded to exclusives or games that benefited more from that console than any others. For those that are on multiple consoles, we have the Best Multiplatform Game award. And as always, with anything that we do that involves the staff picking stuff, there will be spoilers at some points. You have been warned. The swan songs for the DS and PSP get their just desserts. Ford Prefect image was taken from the 2004 movie The Hitchhiker’s Guide to the Galaxy. 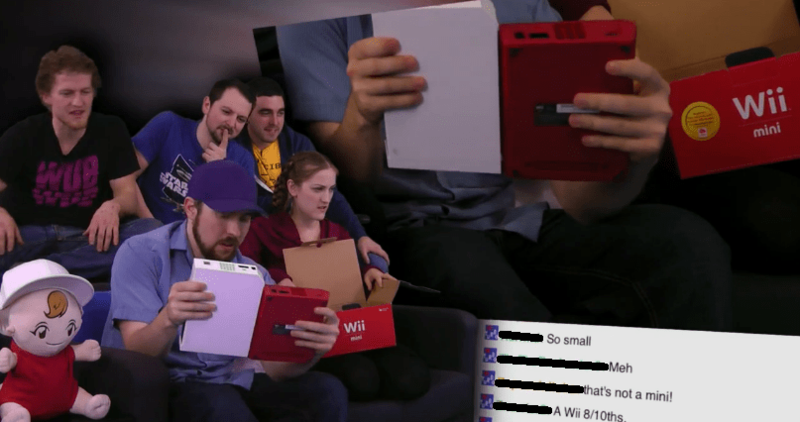 The unboxing image comes from FarFromSubtle’s Wii mini unboxing.